PUCALLPA, Peru — Afraid the police would tip off suspects, Francisco Berrospi kept local officers in the dark when he headed into the rain forest as a prosecutor to investigate illegal logging. Sometimes it hardly seemed to matter, though. Even when he managed to seize trucks, chain saws or illegally harvested trees, judges would often force him to give them back, he said. Bribes were so common, he said, that one anticorruption official openly encouraged him to take them. "The power of the logging industry here is very strong," Mr. Berrospi said. "The corruption is terrible." More than half of Peru is covered by dense forest, including a wide stretch of the Amazon basin, which spreads across South America. Its preservation is considered central to combating global warming and protecting the many species of plants and animals found only in the region. In recent years, Peru has passed laws to crack down on illegal logging, as required by a 2007 free trade agreement with the United States. But large quantities of timber, including increasingly rare types like mahogany, continue to flow out, much of it ultimately heading to the United States for products like hardwood flooring and decking sold by American retailers. The World Bank estimates that as much as 80 percent of Peru's logging exports are harvested illegally, and officials say the wood typically gets shipped using doctored paperwork to make the trade appear legal. It is a pattern seen in other parts of the world, including the far east of Russia, where environmentalists have documented the rampant illegal logging of oak and other kinds of wood bound for the United States and elsewhere. 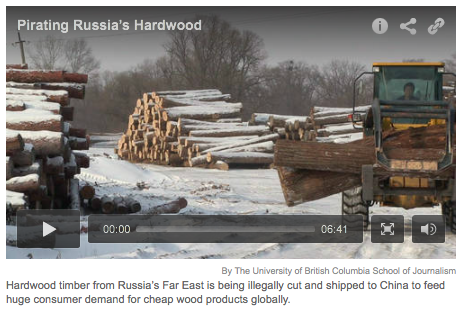 Hardwood timber from Russia's Far East is being illegally cut and shipped to China to feed huge consumer demand for cheap wood products globally. In September, federal agents in Virginia served search warrants on Lumber Liquidators, a major American retailer, in what the company said was an investigation into its importation of wood flooring products. The company has been accused by environmentalists of regularly buying from a Chinese supplier that traffics in illegally harvested Russian oak. Lumber Liquidators disputes the claims, saying that it carefully monitors the origins of its wood. Here in Pucallpa, a city at the heart of Peru's logging industry on a major tributary of the Amazon, the waterfront is dominated by huge sawmills piled high with thousands of massive logs. 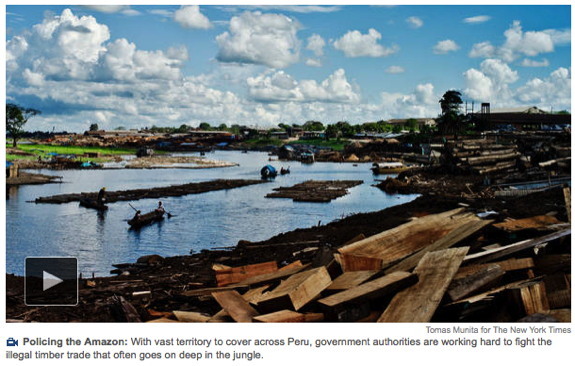 They are floated in from remote logging camps, pulled by small motorboats called peke pekes, while trucks stacked with logs and lumber jam the roads. A military officer stationed here to patrol the Ucayali River said that he had largely stopped making checks of the riverborne loads of timber, though the checks are supposed to be mandatory. In the past, he said, he had repeatedly ordered loads of logs to be held because they lacked the required paperwork, only to learn that forestry officials would later release them, apparently after creating or rubber-stamping false documentation. In some cases, he said, loads of mahogany, a valuable type of wood that has disappeared from all but the most remote areas, were given fake documentation identifying the wood as a different kind. "It's uncontrollable," said the officer, who was not authorized to speak publicly. Referring to local forestry officials, he said, "The bosses give jobs to people they trust and then take a cut of the bribes they get." Mr. Berrospi, who worked as an environmental prosecutor until August, recited a bitter catalog of frustrations. The local authorities are paid off by loggers to create or approve false paperwork, he said. On one occasion, he said, he was offered about $5,000 to stop an investigation. He reported it to a local prosecutor who specialized in corruption cases, but said he was dismayed by the response. "Listen, in one year here you'll get enough to build yourself a house and buy a nice car," he recalled the other prosecutor saying. "So take care of yourself." Lucila Pautrat, director of the Peruvian Society for Eco-development, an advocacy group, said that despite new laws and the mandate under the trade agreement with the United States, the government had failed to tackle deep-seated corruption. "There is a lack of interest, a negligence on the part of the authorities to regulate the forestry sector," she said. "And, meanwhile, the wood keeps going out." The pressure to extract rare hardwoods and other lumber from the Peruvian rain forest has grown in recent years, as neighboring Brazil stepped up efforts to limit illegal logging, Ms. Pautrat said. She compared the situation to the drug trade, where efforts to crack down on cocaine production in Colombia have been followed by a big increase here in Peru. "The pressure here grows," she said. "It's like cocaine. There is a constant demand in the market." Peru's wood exports to the United States increased this year to $20 million between January and July, up from $15 million in the same period in 2012, according to United States Department of Agriculture data. American officials say that Peru has made progress fighting illegal logging, but the persistence of the problem led the Office of the United States Trade Representative in January to demand stronger measures from Peru, including the swift prosecution of government officials and others who violate environmental laws. While the United States, Europe and Australia have banned imports of illegally harvested wood, such efforts are often undermined by corruption and a lack of enforcement, said Kate Horner, a director at the Environmental Investigation Agency, an advocacy group in Washington. "International demand for cheap illegal products is a main driver of illegal logging around the world," said Ms. Horner, whose group has pressed the United States to seek stronger restrictions in Peru and recently issued a report accusing Lumber Liquidators of selling flooring made from illegally harvested Russian oak. Cindy L. Squires, executive director of the International Wood Products Association, an industry group in Virginia, said that it was possible to operate responsibly in Peru, but that it required special vigilance. "This is not the kind of trading you can do from your computer at home," she said. "You need to get out there and see." Mr. Berrospi, a bespectacled 45-year-old who carried antivenom in the jungle in case of snakebite, said officials in the Peruvian capital, Lima, had little idea of the obstacles faced by the country's approximately 80 environmental prosecutors. Most investigations, he said, required traveling to remote areas, but his office had no boat or helicopter to reach logging camps inaccessible by road. Even getting a pickup truck required special permission, and he said he often had to pay for gas from his own pocket. But his greatest frustration came from judges, who repeatedly sided with loggers, he said. In one case, he seized logs that he charged were part of a group of about 70 illegally harvested trees. But he said a judge had quickly ordered them to be returned to the logger. "Do you know what the judge told me?" he said. "She said, 'How am I going to send a person to jail or put them on trial for 70 little logs if I can see thousands or millions of trees growing here?' "
In late May, Mr. Berrospi traveled over nearly impassable roads to a logging camp, seizing two tractors and three trucks. But local agencies refused to help find a place to keep them, so he had to return the machinery, he said. Then, a few weeks after he started his investigation, he said, the local forestry authorities restored the logger's suspended permit without consulting him. In the end, Mr. Berrospi said, his work made him such a "a stone in their shoe" that "the only thing they could do was get rid of me." He was removed from his job in August in what Antonio Fernández Jerí, the head of the environmental prosecutor's office in Lima, said was a reassigning of personnel for "internal reasons," though he praised Mr. Berrospi's aggressiveness, saying that he had done a good job and that there had been no accusations of wrongdoing against him. One investigation that Mr. Berrospi left unfinished involved Saweto, a distant Ashaninka Indian village near the Brazilian border. Edwin Chota, a resident who tracked a large load of logs transported by river from the village, said the barriers to enforcing environmental laws seemed overwhelming. "There is no law," Mr. Chota said, during a visit to the sawmill that held the stacks of massive logs that he had followed from his village. "There's no money to investigate. There's only money to destroy."